"The amount of positive feedback about the site was very rewarding." EditMe's easy content management allow railroad operators to contribute and update site content. Layout customization provides dual modes for logo and navigation. EditMe's built-in Comment feature provides a visitor feedback mechanism, and the built-in search feature makes content easy to find. 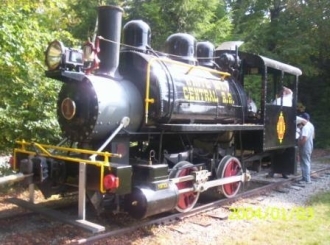 The White Mountain Central Railroad is a historic geared steam tourist train located inside the family-oriented Clarks Trading Post roadside theme park in Lincoln New Hampshire. The park was started by the Clark family 50 years ago as a Sled Dog show. It is still owned and operated by the Clark family and now has many attractions including trained bear show, amazing acrobats, museums, squirter boats, and a haunted mansion. The Clark family needed a web presence for the railroad itself - a place where the public and railroad enthusiasts alike could learn more about the collection and keep updated on news and events surrounding the railroad. Other key requirements were support for both English and French versions, the ability for Clark family members to update and add content, and a feedback mechanism for site visitors. Web master, Peter Bramah, had already built an extensive site on Garden Railroading with EditMe, and knew that it would provide everything the WMCRR needed. EditMe not only provided an excellent value for the railroad site, it enabled Clark family members and railroad operators to update the site content, keeping it fresh and relevant. "My experience with EditMe has been that the webmaster is almost never needed by the content authors," explains Bramah. Given the railroad's proximity to Canada, providing content in both English and French was a must. This was managed easily by customizing the site's Layout to accommodate both languages. A simple Francais/English toggle link in the upper right switches the site navigation and banner image between English and French. Best of all, Bramah was able to do this himself.